There is a yellow butterfly that I see every morning. I doubt it's the same butterfly every time but I'd like to think so. It's my little yellow friend that comes by to greet me and remind me that my day is getting started. It's almost become a routine to wake up and go to my window to watch for her/him to pass by. They have become a pleasant surprise to everyday and I hope I get to continue to see them. Today I was actually outside tending to my garden when the cutie passed by me. I felt the wind of it as it swooped by my face and realized that I had just been given a butterfly kiss. Good start to the day, huh? Now I am just sitting and rewatching Atypical on Netflix. One of my favorite shows ever. Season 2 just came out today and I have already finished it. It came out this morning at 3:00am and I woke up at 7:00am to watch it. I was determined - obviously. The reason I was so determined is because I haven't found a show that I have loved so much in a while. I love it because it makes me connected to every character; even the ones you don't like particularly. It makes me feel as if I am actually standing there - being actually affected by everything that's happening. To me - yes it's a TV show, but it's also a lesson for me to treat people better than they have treated me, to accept people for who they are, and to accept yourself and all your faults. If you haven't found a show, book, or movie that makes you feel that way then I encourage you to explore what you enjoy more and find one. It's worthwhile to find something you can be so passionate about and enjoy - especially something so simple. I've been alone since Wednesday and will have the house to myself until Sunday. It has been fun to get to have time by myself but I can also admit that it has been weird to not have someone home. I have lived with my roommate and boyfriend for 3 years, so as you can assume I have gotten pretty use to having them around. While I miss them, I know that it's good to have alone time. It's good because then you can get truly comfortable with yourself, get things you need done - done, and enjoy some peace and quiet. Which are all wonderful things. Recently I have been working on getting comfortable with myself so this time alone is great for me, although it comes with being lonely sometimes. You see, with being alone I have realized that yes - sometimes there are going to be things that you aren't going to enjoy - like loneliness. But getting used to these feelings and dealing with them makes it all that much easier. Once you learn to get passed these negative feelings you can truly start to enjoy all the positive ones. One day at a time I am learning to face all the negative, as I hope that you are too. Because soon enough we will get to enjoy all the positive that follows. It may take a while; I know that, but as they say patience is a virtue. Even though it sure as hell doesn't feel like one. So be patient and let the good things come to you. 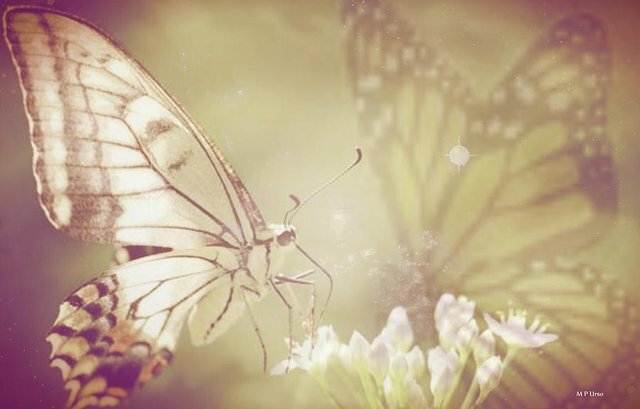 A little research will reveal that butterflies are quite the mystical creatures. I am of the belief that loved ones recently crossed over will make their presence known by these beauties. Btw, it's prolly the same butterfly as they tend to make the daily rounds of pollinating their favorite plants.